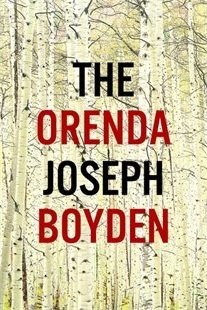 … The Orenda, Joseph Boyden’s story of the trials, tribulations and struggles of a Wendat (Huron) tribe in southwestern Ontario in the seventeenth century. The novel features three voices — Bird, a warrior elder; Snow Falls, an Iroquois girl he takes as a hostage and adopts as a daughter; and Christophe Crow, a Jesuit missionary who brings both Christian faith and devastating plague to the native community. It was the unanimous choice of the four Shadow Jury members. I’ve included both the Canadian and UK covers in this post because I think they illustrate two quite different (and legitimate) responses which the cover designers had to the book. While it is hard to see in the electronic version, those are birch trees on the Canadian cover — nature as both a nurturing and threatening force is very much a character in this novel. The UK designer, on the other hand, opted for a dualistic image that portrays both a warrior face and the metaphorical crow of the Jesuit — a stuffed raven also features as an orenda that Snow Falls finds in her search acknowledging her arriving womanhood, so this version captures images for all three voices. As Giller followers know, The Orenda will not be winning the Real Giller — for the first time in its 19-year history, the Shadow Giller Jury opted to call-in a title that was not on the official Giller shortlist. Both Kim and Alison had read Boyden’s novel before the shortlist was announced and felt strongly that it should be included; Trevor and Kevin were eager to add it into our consideration. That late addition means only Kim and I have posted a review at this date — you can find Kim’s here and mine here. Trevor’s should be posted in a few days (I’ll amend this post with links when it is up). 1. Trevor: The Orenda, Boyden 34; The Crooked Maid, Vyleta 27; Cataract City, Davidson 21; Caught Moore 17; Hellgoing, Coady 16; Going Home Again, Bock 5. 2. Kevin: Boyden 30, Vyleta 24, Davidson 21, Bock 17, Coady 14, Moore 14. 3. Kimbofo: Boyden 50, Vyleta 30, Bock 15, Davidson 12, Coady 8, Moore 5. 1. Trevor: Vyleta 33, Davidson 25, Moore 19, Coady 18, Bock 5. Kim, Trevor and I have all reviewed The Crooked Maid — you can find links in the side bar on the right. And so all that remains now is to sit back and await the Real Jury decision from a list that we obviously felt missed the best book. I speak for all four of us in saying that we felt this year’s Giller reading was much better than last year’s — there may have been stronger long and short lists in the Giller’s 20 year history, but this one is a vintage that can hold its head high. Finally, again from all four of us, our thanks to all who followed our deliberations. We look forward to next year. This entry was posted on November 4, 2013 at 9:39 am and is filed under 2013 Giller Prize. You can follow any responses to this entry through the RSS 2.0 feed. You can skip to the end and leave a response. Pinging is currently not allowed. Thank you for such interesting and stimulating discussion about the Giller prize. Not having read any except The Orenda I can’t say much but I too felt as all of you, Boydens book is outstanding. I look forward to Kevin’s review and also one for The Lowlands. I’ll finally be getting to The Lowlands soon — I’m afraid that my prize reading piled up a bit this year (they seemed to be longer than usual) and it was one that got set aside when the Booker winner was announced. For me, both The Orenda and The Crooked Maid would have been entirely worthy Booker longlist titles — although I would also have to say that the Booker-winning The Luminaries should have been on the Giller longlist (and would have been on my shortlist). I really enjoy following your Shadow Giller discussions and usually pick up a book or two from the list. I usually wait until you’ve reviewed a few of the short list before I choose what to read (plus my choices are limited as many of these books are not yet released in Australia). I am over half way through The Crooked Maid and loving it and I have bought The Orenda (which I have decided to give to my husband for Christmas as he will love it too). So thank you to all of the Shadow jurors, this is a great promotion of some well-deserving Canadian literature. Thank you very much for your kind words — I’d say you have made a very good choice with your two selections. I am planning on returning the Antipodean reading favor between now and year end. I have a whole shelf of unread ones on my hands — Kimbofo sent me My Brother Jack, Charlotte Grimshaw was featured at our local authors’ festival and I have a whole stack of Alex Miller’s to get to. And that is just for starters. Two books for my shopping list! Thank you all, as usual! Always glad to find a way to help you invest. 🙂 I think you will find both worthwhile. 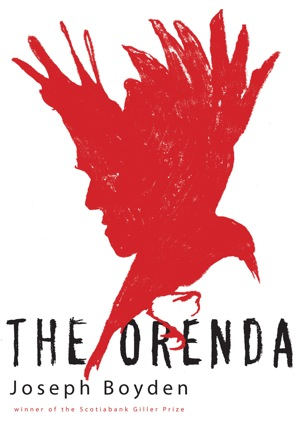 I’m hoping my bookgroup will vote for The Orenda for 2014…I am shamelessly barracking for it. Barrack on — I think an Australian audience would find a lot to contemplate in the novel. Sometimes it is easier to understand how wrongly aboriginal people were treated by looking at examples from elsewhere and then relating back. 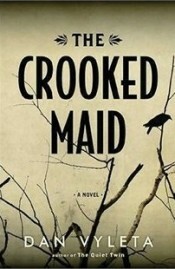 I can’t wait to read the new novel from Joseph Boyden, he is an outstanding writer and unfortunately this is not the first time he is left out of The Giller 😦 I will be definitely checking the Crooked Maid too, sounds really good! As you can tell from both our votes and comments, the Shadow Jury can’t understand why he was left off the shortlist. The best hypothesis that I could come up with is that the first 100-150 pages are a bit of a challenge — there is a lot of violence and it took me a while to feel in tune with the three narrating voices (and there is a fair bit of plot background that needs to be put in place). I could see where a juror looking at a pile of more than 140 books to read might become impatient. Sorry Tony, your comment came in before my post on the Real Giller decision was up. As you correctly report, none of the four of us were remotely close to agreeing with the Real Jury this year. That’s the way it goes sometimes, I guess. I think we did rather tip our hand when we decided to call the novel in — but I’m glad we did. It will be interesting to see how it does in the Governor-General’s awards where it is shortlisted — but faces competition from four strong novels, including the Booker-winning The Luminaries. None of the five G-G nominees (The Hungry Ghosts, The Lion Seeker and A Beautiful Truth) made the Giller shortlist — I would rank all three that I have read ahead of the G-G winner, so I am obviously out of touch with this year’s jury. Thanks for the comment, Kerry, because it gives me a chance to say something about The Orenda that I might (or might not) be able to fit into the review when I get to it. I had originally thought it was part three of the trilogy but a commenter pointed me to an interview where Boyden says it is not: rather it was a book that demanded he write it. In some ways, it is in fact a “prequel” to the trilogy, although we do not discover that until the final pages of the book. The key Huron character in the book is “Bird” — the family at the centre of Three Day Road and Through Black Spruce is the Birds. In the final pages (which are not really what the book is about), The Orenda is an explanation of how they came to be in Moosenee/Moose Factory on the shores of Hudson Bay. I can understand why Boyden felt that he had to write it. Given your background, I’d suggest starting with The Orenda (although wait until you see the review) — it is as good an example as I can remember of the exploitation of Native people in the “opening” of the New World. The other two, on the other hand, are more about ongoing relations with the conquering Europeans (and Through Black Spruce is very contemporary in that). Thanks. The Orenda moves onto my shortlist. You guys have given me good recommendations in the past and seem particularly enthusiastic about this one. And thanks for the forewarning about the first 140 or so pages. That always helps. Eager for the review. Now if only it would make the Tournament of Books field. Our NWT Giller (not so light) Bash had similar voting results to the Shadow Jury. So we were disapointed and confused by the Giller choice but had a greay party despite the results. Prize for the winner of our draw was Orenda. Thanks for checking in with that. I suspect aspects of the “frontier” in Boyden’s novel had more personal meaning to people at your bash than they did those here in the South. As a reader who prefers longlists to shortlists, I appreciate the group’s decision to pull one of the other titles into final shadow-contention. But I was expecting a little more from The Orenda, so I didn’t respond quite as wholeheartedly as the shadow jury did. Nonetheless, I both loved and admired Dan Vyleta’s novel, so would have been pleased with that outcome. Some great reading this year, and it’s been fun following your discussions. Thanks for your comments. I think it is fair to say that the tastes of the four of us have a fair bit of overlap and it is more than worthwhile to get a different perspective.